You really don’t know, or haven’t seen the real Hong Kong unless you’ve experienced the spectacle- and it’s an odd spectacle- of hordes of local families attacking the buffet tables at any hotel in Hong Kong, usually saved for the weekends. It’s like Braveheart charging at the enemy, but much more scary, with there always being the chance, if in the way, of being kicked in the groin, pushed, shoved, and knocked down and knocked senseless with a crab claw as everyone rushes for the section serving what’s always considered expensive dishes- sushi, sashimi, king prawns and lobster. Who cares if all these might be leftovers? 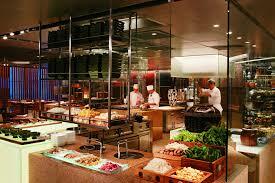 Hong Kong’s love and affection- and appetite- for international buffets is blind. All you can eat becomes tantric yoga inhalation. There’s then the fascinating sight of kids, helped by their parents and other family friends and members, building pagodas of food onto their plates- noodles, curries, sushi, sashimi, satay with a few desserts on top. It’s all a little like Violet Beauregard from Charlie And The Chocolate Factory and something that would have fascinated Roald Dahl. Yes, eat as much as you want is taken to new levels, and for around three hours, life becomes one big buffet cabaret. The only thing missing is Liza Minelli bursting into song. Where are the best buffets, but not attracting the hungry hordes led by Attila The Hungry, because they might be a tad more selective and beyond most budgets? 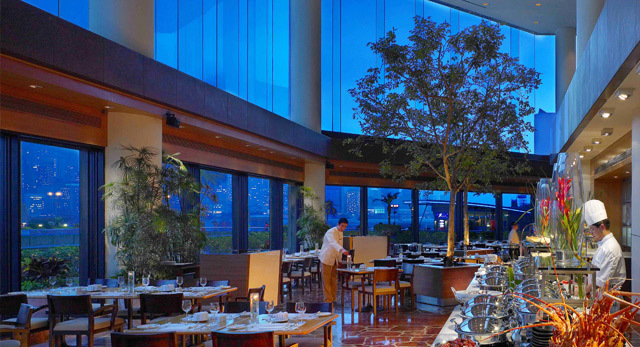 First choice: The International Saturday and Sunday Brunch at Brasserie On The Eighth at the Conrad Hotel. 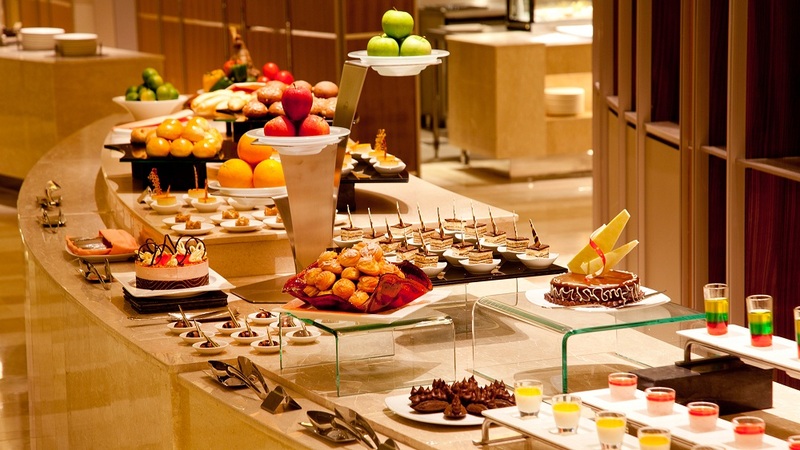 This buffet is the best we have enjoyed anywhere in the world, especially as a Sunday Brunch. There’s something for everyone- a section with different curries, Japanese and Chinese cuisine corners, a Roast Beef carving area with all the trimmings and more- a great salad bar, a huge selection of desserts…Sorry, but we’re starting to drool. 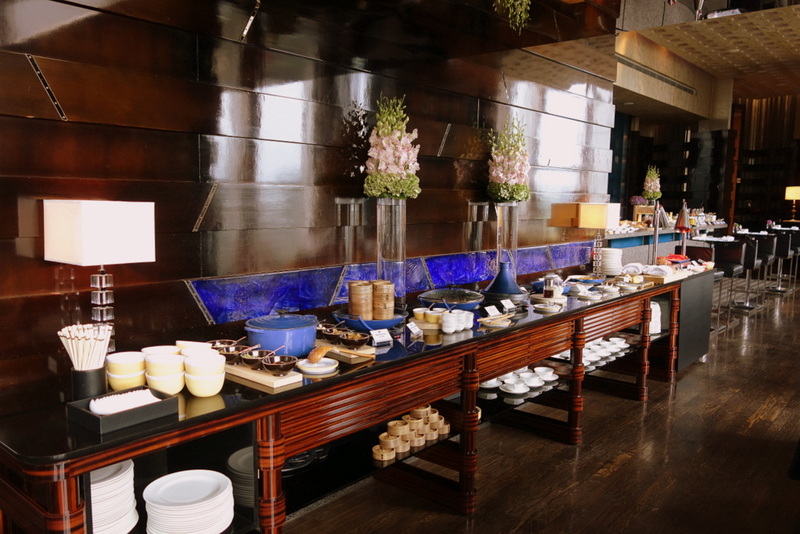 On weekdays, strongly recommended is the international- with the accent on more healthy dishes- lunch buffet at the Blue Bar of the Four Seasons. The drink list has some very creative health drinks whereas you’re not going to leave feeling like a balloon about to pop. It’s a very sensible buffet and the perfect setting for a lunch meeting. Harbourside at the Intercontinental is excellent- expensive, expansive with free beer, wine and champagne and always the chance that you could be sitting next to a visiting celebrity. This is The Big Day Out and Big Daddy of buffets. This is where Sheikh Yerboutis break bread and talk big money deals with Chinese investors. The one danger is that this is the type of venue that would attract Donald Trump. He might try to build a wall around the buffet area just to keep himself out. 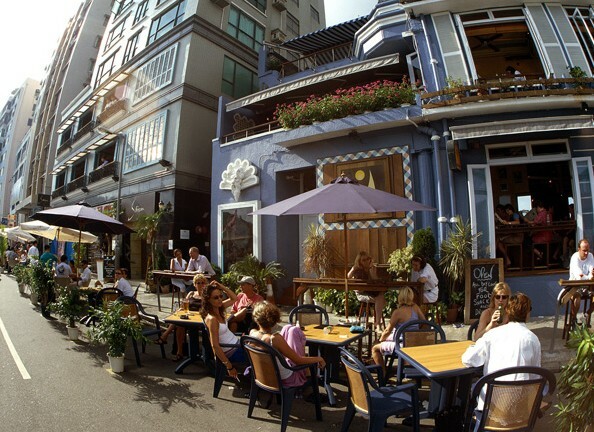 My lady friend who’s still exploring and discovering Hong Kong, a city new to her, and the outlying islands, strongly recommends taking a boat and heading out with a group of bon amis on a weekend to any of the seafood restaurants on Lamma Island. It might not be an international buffet, but it’s a brilliant and inexpensive Chinese seafood free-for-all with lotsa Tsingtao Beer. 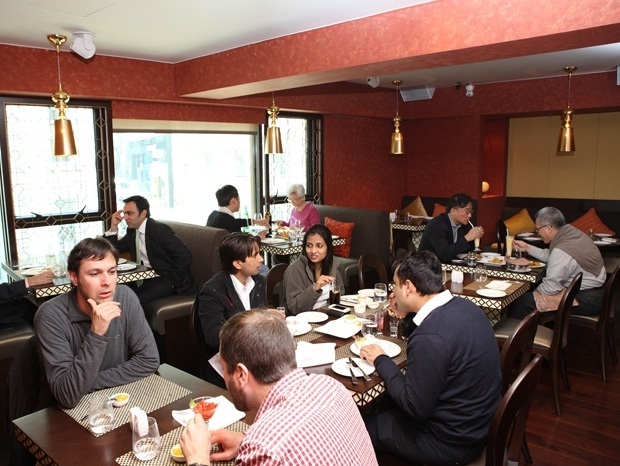 Also high on her list is the buffet at the Jashan Indian Restaurant (1st Floor, Amber Lodge, 23 Hollywood Road, Central, Hong Kong)- again, inexpensive, but an authentic buffet with everything from the sub-continent. When in possession of my credit card and tired of looking for bargain eateries, she goes like the clappers to the Island Shangrila and Cafe Too. To each their own, but the latter is way too much of a culinary hodge podge and local families high on buffets. It’s all a bit like Grand Central Station. 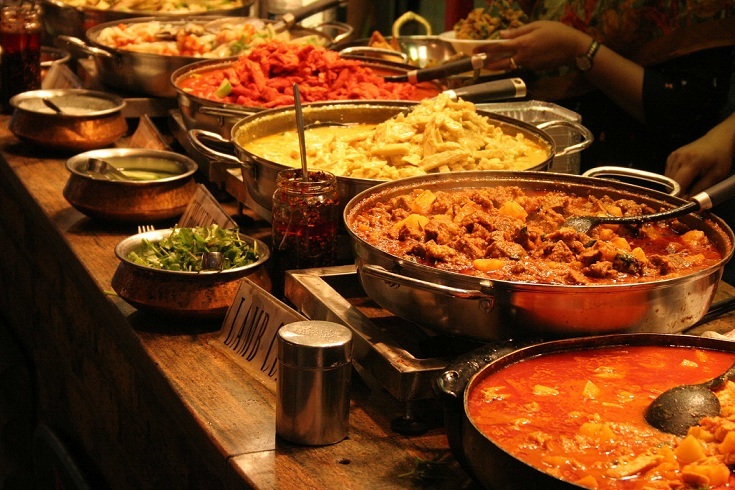 At the other end of the taste buds is the daily Indian buffet at the Conrad. It’s all here, chaps and chappatis- everything from excellent Chicken Tikka, various vegetable dishes, naan and samosas to different curries- and on the mild side of the sub-Continent as opposed to those curries that set off volcanic-size eruptions in your stomach, where panic sets in and you wonder whether to go or to stay. My, my, some of the goings on that took place at the back of the bar back in the day. If strategically seated and facing the mirror, there was always Fifty Shades Of Grey going on in the background until those involved finally got themselves a room. There are, of course, other buffets, but having tasted many, these are our top picks. And if you care- and dare- to try a buffet somewhere else, just beware of the fat children bearing food pagodas on their plates- and remember that you’re invisible to them. 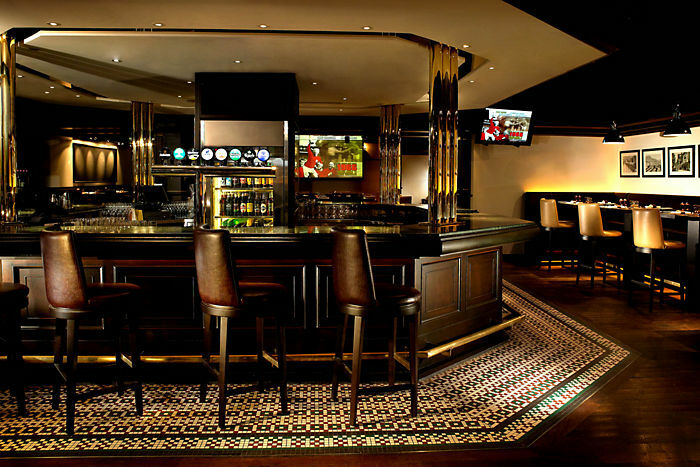 This entry was posted in Hong Kong Racing, Horse Racing and tagged BRASSERIE, Chicken Tikka, Conrad, Conrad Hotel, Jashan Indian Restaurant, Lamma Island. Bookmark the permalink.